with male square 3/8 ", 1/4" or 1/2 "
and Manufacturer, 1000V and Double Triangle respectively VDE-Sign. Torque Wrench 1000 V 1/2" and 3/8"
available in 3/8" and 1/2"
Extension Bars 1000 V 3/8" with Bit-Holder 1/4"
with square drive for sockets 1/2 "or 3/8"
Preset Torque Wrench 1000 V 3/8" and 1/2"
Extension Bars 1000 V with automatic lock screw device 1/2" and 3/8"
Torx Sockets 1000 V 3/8"
Multipoint Sockets XZN 1000 V 3/8"
Tool Case heavy Leather red with 35 Safety Tools and Devices. Toolcase VDE 1000 V 3/8"16 pcs. Tool Case VDE GS 1000 V 3/8" mechanically locked retaining system, 11 pcs. Toolcase VDE GS 1000 V 3/8" friction locked system 13 pcs. 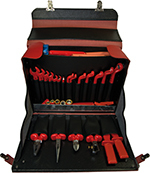 Tool Case Case VDE GS 1000 V 3/8" friction locked system, 11 pcs.